"So have you worked on your novel at all recently?" a friend asked today. The answer to that question is no. No, I haven't worked on it recently. I haven't even opened the story file in weeks. I've avoided even thinking about it this week -- even though I've had time to think about it. And even though I've spent most of the last two years blogging about how I don't have time to think about it. I'm the worst kind of whiner. When the pangs of guilt start creeping up I push them down with the efficiency reserved for the dog when he's forced to swallow entire bagels whole after stealing off the table lest he risk of having them stolen from his jowls mid chew. depending on what Disney Jr. show she's more into that day. quest to indoctrinate the brains of our nation's youth. My guilt is a honey-walnut cream cheese slathered blueberry bagel and I am the beagle that stomachs it in one tremendous gulp. I haven't been working on my novel. But I have been making a large quantity of stick horses. 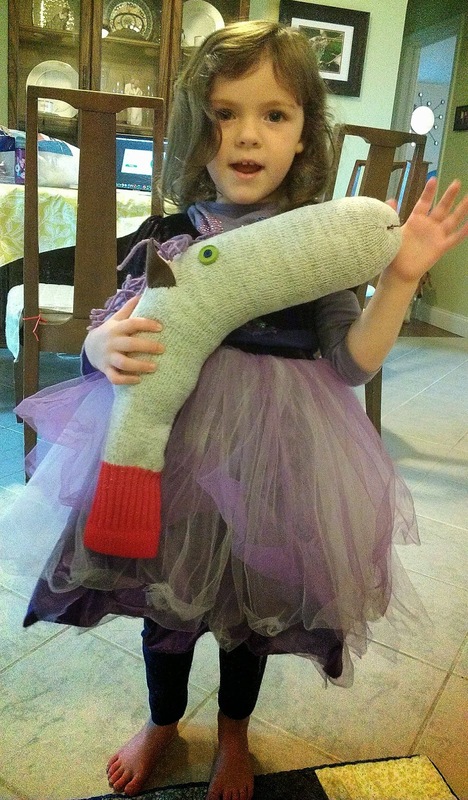 You know how the saying goes -- those that can't write, make disembodied equine heads out of used socks, buttons and yarn. I might not have that totally right. Anyway, since my brain has taken an unapproved writing/creativity vacay, I decided to put my fingers to work with a little crafting. See my friend is hosting an event at her farm to benefit PaWoundedWarriors.com in May. 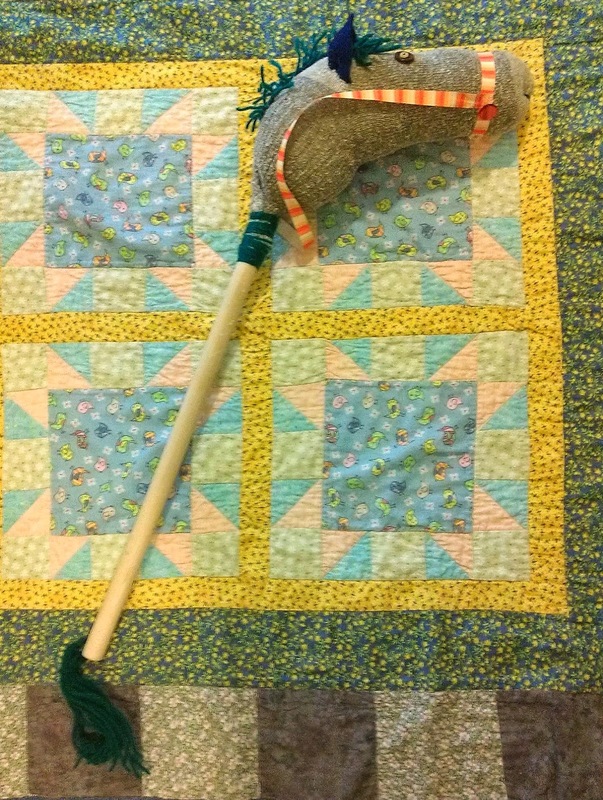 And despite the fact that my sisters teased me about the stick horses I made for the girls (they couldn't stop themselves from suggestively stroking the sock head -- we're a perverse bunch) they thought that other, less disturbed people, might be willing to pay money for a handcrafted stick horse. So I thought I'd make a bunch to try to sell at my friend's party to help raise money for the wounded warriors. So that's my excuse for not writing. It's getting a little creepy at my house right now though. See, I haven't gotten bodies for my stick horses yet, so right now I'm just amassing stick horse heads. All the pretty little horses' heads. It's like the prop closet for an ill-conceived children's theater staging of "The Godfather." Lily is not at all fazed by the fact that none of the horses have bodies. In fact, she attempted to gallop around the house using just the neck of one of my half done ponies, which I'm sure will not leave her permanently scarred when she reflects on her childhood in therapy years from now. For those of you living in the Mid Atlantic (or any of the Ukrainian readers Google Stats reports I have scads of) looking for a family-friendly adventure, please consider checking out Blue Hound Farm's 200-year Barn Birthday Bash 10 a.m. to 6 p.m. May 17 at 125 Pleasant Hill Road, Lewisberry, Pa. Cost is $10 for adults, $5 for children 12 and younger and free for veterans and active military with ID. All the money raised will benefit Pennsylvania Wounded Warriors Inc.
You're also welcome to test-trot one of my stick horses (which Lily demonstrated today also make fantastic weapons -- especially when battling little sisters) or get a henna tattoo from my sister Sarah. Blue Hound Farm is one of the most beautiful places you'll ever visit (and I've been to Yosemite, so I know about such things) and there's plenty of cute critters (pigs, goats, horses, chickens, ducks, cows, etc.) and great photo ops. It's a magical place. So. You should go and stuff.